According to the American Society of Civil Engineers, the U.S. needs to spend an extra $4.6 billion over the next decade to bring its infrastructure up to snuff. At the same time, the global urban population will grow by about 1 billion people over the next decade, requiring substantially more than that to be spent simply to get enough water and power to them all and to build enough roads and telecommunications infrastructure to meet their needs. Extrapolate all the modernization and expansion needed on a global basis out over the coming decades, and the G20 estimates it will take $94 trillion in spending to support humanity's needs by 2040. Simply put, this is a massive, massive global need, and it's one of the rare issues for which there is wide bipartisan support to increase spending. Put it together, and that makes it a compelling opportunity for investors willing to ride out the cyclical nature of infrastructure spending and patient enough to enjoy the rewards the best companies can produce. Here are three that are well positioned to win the infrastructure marathon and are worth buying now: steel-making giant Nucor Corporation (NYSE:NUE), global infrastructure owner and developer Brookfield Infrastructure Partners L.P. (NYSE:BIP), and high-growth engineering company NV5 Global (NASDAQ:NVEE). No other company produces more steel -- and steel profits -- in North America than Nucor. Whether it's rebar for concrete construction, tube steel for uses including energy transportation and production, or the beams used to build bridges and skyscrapers, Nucor is a leader in steel for infrastructure. NUE PE Ratio (TTM) data by YCharts. 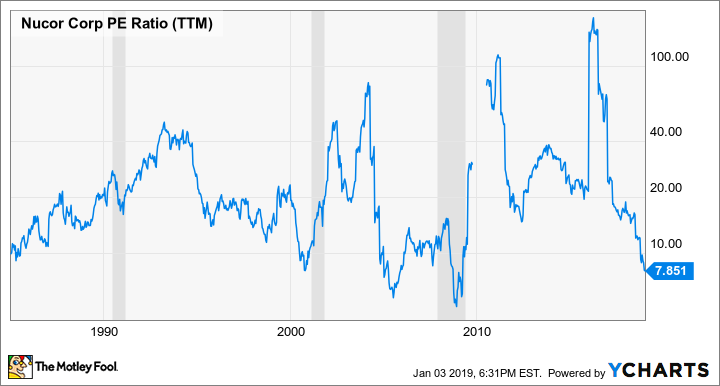 As the chart shows, the last time Nucor was cheaper than this was during the Financial Crisis in 2009, the worst global recession in 80 years. 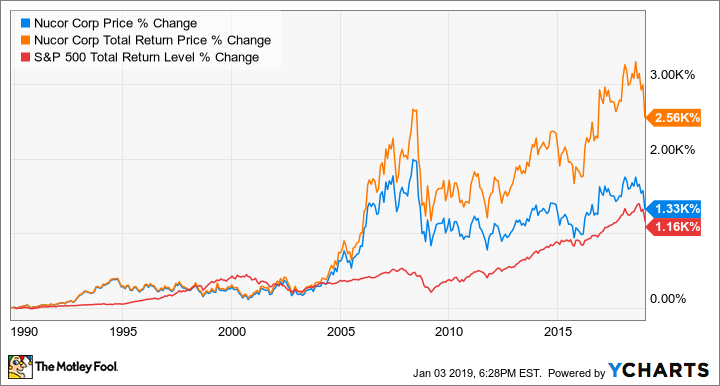 Furthermore, the sell-off has pushed its dividend yield back to 3%, a solid payout that's likely to grow; Nucor has increased its regular dividend every year for more than a half century. Add it all up, and Nucor is worth buying now and holding for many years to come. Check out the latest Nucor earnings call transcript. Brookfield owns the infrastructure. You get paid. Like Nucor, Brookfield Infrastructure Partners is led by management with an impeccable track record at managing and allocating assets and capital to deliver great market-beating returns. Also like Nucor, Brookfield Infrastructure's price has fallen more than 20% from the peak. But while Nucor's stock has fallen on fears of weakening steel demand and oversupply, Brookfield Infrastructure's price has fallen because asset sales have taken a bite -- albeit a temporary one -- out of its cash flows while management takes its time to redeploy that capital. The result? Mr. Market's short-term focus has created an excellent buying opportunity for long-term investors. Since agreeing to sell its Chilean electricity transmission business for $1.3 billion in late 2017, management has identified and secured $1.8 billion in higher-return investment opportunities. As those deals close, it will reaccelerate Brookfield Infrastructure's cash flow growth sharply. Investors who buy now can position their portfolios for big gains over the long term as management follows this same strategy of selling low-return assets at a premium multiple and then opportunistically redeploying that capital into higher-growth, higher-return assets. Brookfield Infrastructure's distribution has increased by 700%, and investors have enjoyed 389% in total returns since the company went public. 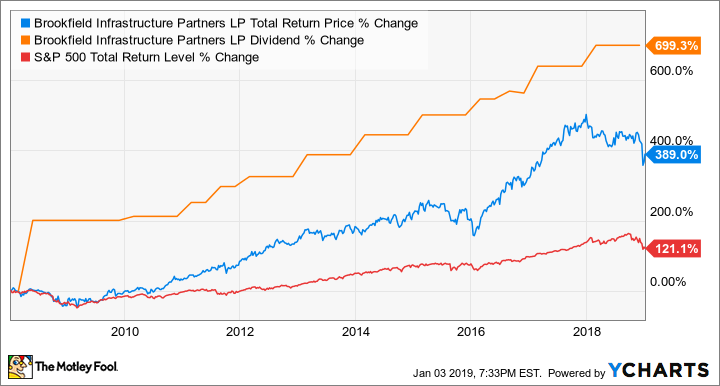 These great returns are primarily a product of the same approach to capital deployment that's caused the market to sell over the past year, creating a great opportunity for savvy investors. Trading for less than 10 times projected 2019 funds from operations, Brookfield Infrastructure is a steal. An often-overlooked part of infrastructure is the engineering and project management that goes into developing and building structures. It often takes years and a lot of money simply to get to the point of breaking ground on a project, and it takes a lot of experts in multiple disciplines to see a project from initial proposal to implementation. Furthermore, with more than 100,000 separate firms operating in the U.S. alone, it's even more challenging to manage large infrastructure projects, since it often requires multiple firms with different specialties working on a single project. Dickerson Wright, founder, CEO, and biggest individual shareholder of NV5 Global, clearly recognizes this for the opportunity that it is: to consolidate many of these small, single-discipline companies under a single umbrella. By combining multiple disciplines into a single entity, NV5 is able to offer more of the services an infrastructure project may require while also delivering them at a lower cost and higher profit. It's certainly paying off so far. In the roughly six years since going public, NV5 has grown revenues 536%, while earnings have increased 743% per share. And it's not just acquisitions that's delivering the growth. Last quarter, organic sales increased 10%, in large part because NV5 is able to cross-sell the mix of services it offers, creating more value for its clients managing big projects. NV5 stock has also taken a recent beating, down 35% from its peak. That means you can buy a company growing earnings at a solid double-digit rate for about 23 times expected full-year 2018 earnings. Considering it finally reached $400 million in annual revenues in 2018, that's a small price to pay for its growth rate and prospects. Check out the latest NV5 earnings call transcript.